Last night I had the good fortune to attend the 10th birthday party for the Live from Memphis web site. The party was conveniently located across the street from my building, at site founder Christopher Reyes’ loft. LFM has done an incredible job spotlighting Memphis music and all that is good in this city for the past decade. If you want to know what’s going on, it should definitely be in your bookmarks. Congratulations to Christopher and all who contribute to LFM. I was going to post about the stuff going on in Egypt, but this is more important. Bardog Tavern has increased the price of a pint of PBR to $3, as shown on the image above which was texted to me this afternoon. 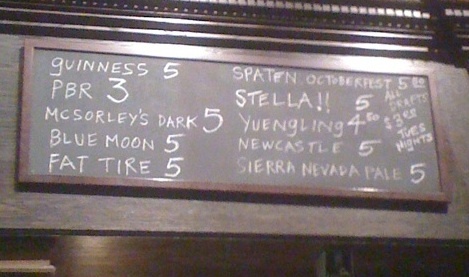 Also note that Yuengling has gone up 50 cents as well, to $4.50. Still a damn good place to hang out, it’ll just cost you a bit more if you drink certain beers. Couple of pieces of good news for beer lovers in Memphis. First of all, Ghost River Brewery at Main and Crump is spending $750,000 on an expansion. That will allow them to bottle beers and sell them at retail locations. Pretty soon you’ll be able to pop open a bottle of Ghost River Golden, and people who come to visit from out of town will be able to take some fine Memphis beer home with them. If you’ve ever thought about brewing your own beer at home, this weekend would be a good time to give it a try. Groupon has a deal with weekend for a $40 beer brewing kit from Midsouth Malts for $20. There are two different kits to choose from. 1) Stop by 431 S. Main, where the Memphis Songwriters Association will have a CD release party at the Memphis Music Foundation headquarters. Live music by local artists, and you’ll be able to buy the new CD full of performances by MSA members. 6-9 PM. Light snacks provided. Free food? Wonder if the Nuh-Uh Girl will show up. 2) If you’re looking for something to do after Trolley Night, check out the Prime Cut Band at the Marmalade Lounge on G.E. Patterson. They perform from 9 to midnight. Couple of events for the kids tomorrow. First of all, there’s a skateboard competition at Greenlaw Community Center at 190 Mill Avenue. Get the details in this Memphis Daily News article. Secondly, there’s a dance party tomorrow at the Rumba Room from 2 to 5. Kids 7 and under are invited to come get down to kid-friendly dance tunes at “The Little Disco.” There will be healthy snacks, stroller parking, and changing stations. Adults not allowed unless accompanied by kids 7 and under. $10 adults, $10 kids, free for non-walking infants. The Grizzlies host the Washington Wizards tomorrow night at the FedExForum. O.J. Mayo will serve the first game of a 10-game suspension for testing positive for over-the-counter substance DHEA. Ironically, tomorrow is O.J. Mayo bobblehead night with an O.J. mini-bobblehead for the first 5,000 fans. I’ll be out at a couple of parties tonight. Will bring the camera in case anything blog-worthy happens. Running is probably the last thing you ever expected to see discussed on my blog, but since a lot of my readers run with the Salty Dogs, I figured I should mention this: Popular iPhone/Android app RunKeeper Pro is now free. Before, it sold for $10, and a one-month trial period as a free app convinced them they should make it free permanently. Several people I know use it. They tell me it’s a GPS program that keeps stats on your run and it’s really cool. I don’t have first-hand experience using it though; I’m too busy recording beers on Beerby. By the way, if you don’t know who the Salty Dogs are, show up at Bardog around 6:45 on Monday in your running gear. You’ll meet some cool people. In other news… it’s poker night at Bar None, at 7:30. Wonder if attendance will increase, since I posted pics of the swanky Grizzlies seats and free buffet and beer I got for winning last week. I’ve heard the Nuh-Uh Girl say “I need to check out poker” a couple of times this week. I won’t repeat my win, though… I’ve stayed out past midnight the past three nights, and it is imperative that I catch up on sleep to get my batteries re-charged for the weekend. I actually probably will play some poker tonight, but at home, on PokerStars. Good luck to all who play at Bar None tonight. After our disastrous showing in trivia last night, some of the gang decided to head down the street to Bar None. We relaxed on the couches, drank PBR, and ate crawfish dip. The Nuh-Uh Girl, who protested that she was on a diet and didn’t want to eat, soon dived into the crawfish dip and finished off about half of it by herself. 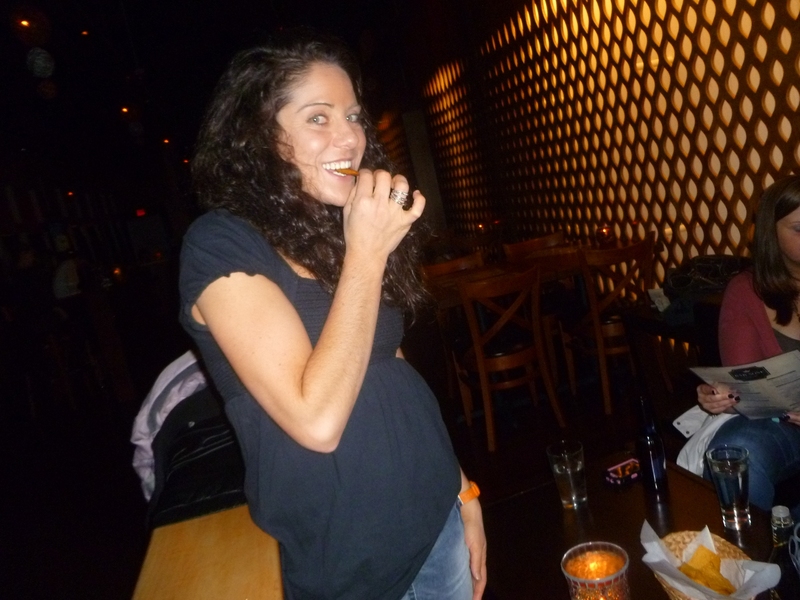 The Nuh-Uh Girl graps a chip and digs in. The Nuh-Uh Girl taking one of the many bites of crawfish dip she had last night. Then our friend Joe decided to order the pub’s signature one-pound burger. They warned him it would take 25 to 30 minutes to cook, understandable for a burger of that size. The burger took up so much of the plate that more fries had to be brought in a separate cup. One pound is a lot of burger, but given who was standing to his immediate left, Joe was aware that he would have “help” eating the burger. 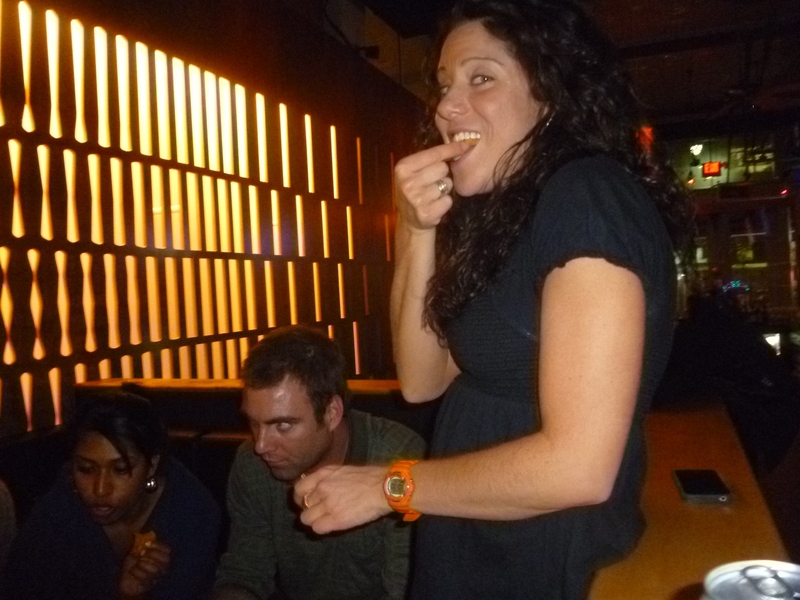 ... and before long, she had moved on to the burger. Good times. Live music with Kirk Smithhart there every Tuesday night. Tonight they have karaoke, and tomorrow night is poker. Circa by John Bragg re-opens tonight. It closed its Downtown location in October (which has since turned into Bar None) in order to find a place out east to be closer to its customer base. Yesterday a co-worker asked me how to get to the new Circa. I replied, “I think you take Poplar out past the 240 and then turn left or something.” That’s pretty much how I give directions to anything in East Memphis. Actually the restaurant is at 6150 Poplar. 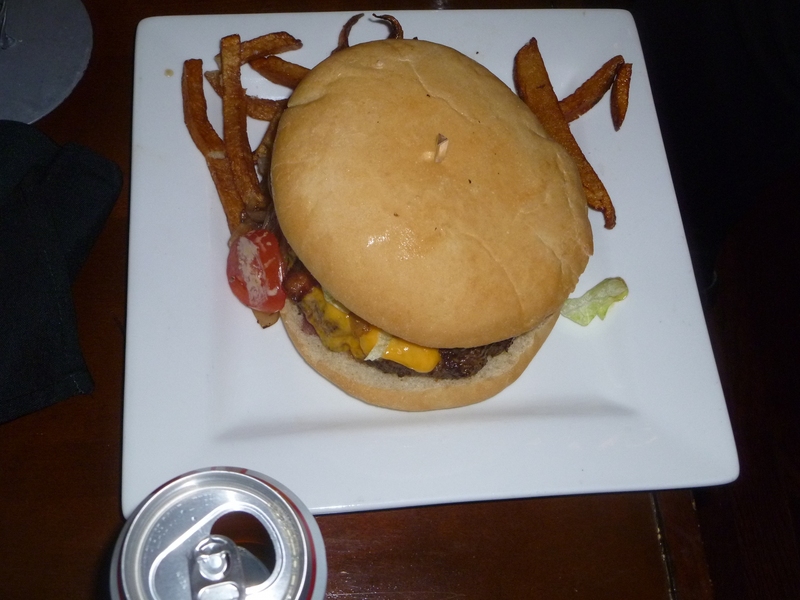 Speaking of Bar None, I was in there last night and took a photo of the 1-pound Bar None burger. I don’t have the camera with me to download pics, though, so it will have to wait for tonight. The Nuh-Uh Girl, supposedly on a diet, was all over an order of crawfish dip, and of course she had to have a bite of the burger. Speaking of the Nuh-Uh Girl… she’s really, really hoping that February 2 is a cloudy day. That’s because Memphis-area Chick-Fil-A locations will give away free spicy chicken biscuits if the groundhog does not see his shadow. A portion of all sales that day will be donated to MIFA. First United Methodist Church. 204 N Second. (901) 527-8362. Dinner: 6pm; program: 6:45pm. $7 per person; $15 per family. In this five-part series each Wednesday evening, First Church member, Larry Chitwood, leads the discussion concerning appropriate, Christ-centered actions addressing poverty on a personal or organizational level. Participants will learn steps to take to be an effective servant without getting suckered. Sounds like a good way to learn how to serve those truly in need, without supporting the lifestyle of some of the scam artists who operate Downtown. Also don’t forget that the Silly Goose’s second birthday party is tonight at 9. Live music from Jeremy Stanfill and shot specials. Other events going on tonight: Tiger home game vs. UCF at 7, FedExForum; poker night at Bardog, 7:30; Pint Night at South of Beale. Yesterday I wrote about Valentine’s Day gifts delivered by Grizz. If baseball’s more your sweetheart’s game, you can arrange a Rockey Redbird delivery. For $75 Rockey will deliver two Dugout level ticket vouchers, a $20.00 gift card to Pugh’s Flowers, $10.00 in Redbirds bucks and a single rose ($100.00 value). He will deliver either Sunday the 13th or Monday the 14th. Only 10 Rockey deliveries are available, so if you want to reserve one call 901-722-0295 now. If you want the package but don’t need the special delivery, you can buy the package for $40 and pick it up at the Union, Poplar or Whitten Road Pugh’s Flowers location. This isn’t a Downtown thing, but I know some of my blog’s readers (one in particular) like to hear about free food. Pei Wei is adding Korean BBQ to the menu, and they’re offering a deal to get people to come in and try it. Go by Pei Wei this Wednesday or Thursday, and they’ll give you a card good for a free order of Korean BBQ the week of January 31-February 6, dine in or take out. Free food? Wonder if the Nuh-Uh Girl will show up. Big night for TV: City Schools consolidation debate on Channel 3 from 5:30 to 7:30, then President Obama’s State of the Union address at 8:00. A recruiter friend of mine has several Java and .Net positions open. If you’re looking for this type of work shoot me an e-mail at paul@paulryburn.com and I’ll get you in touch with her. I’ll be at trivia tonight at the Saucer at 7. Guess I’ll either DVR the schools debate and State of the Union, or just read transcripts later. Very fun day at work… finally getting to set up our Intranet installation in WordPress after months of discussing it! Going to grab a quick bite to eat then get back to it! ESPN, in their Bracketology column, now has Memphis projected as going to the Big Dance. They have us as the favorite to win the C-USA tournament and earn an automatic bid, getting the #12 seed in the West. Thanks to sports writer Doc Hancock (@DocHancock) for mentioning this on Twitter earlier today. Hey, you know who I don’t see in those projections? Tennessee. It’d be awesome if we made it to the NCAA tourney while Bruce Pearl was sitting at home watching it on TV… you know, like he’ll be doing for the next four SEC games. Envision Fitness and Mona Spa, on the third floor of the Cadre Building at Second and Monroe, are having a Wine, Cheese, Reflexology & Massage Night tomorrow night, Tuesday 1/25, from 5:30 to 8:30. Meet Gail, Mona’s new addition, and enjoy learning about reflexology from her and get chair massages from Nathan. Chilean wines from North Berkeley imports and cheese. Free cheese? Wonder if the Nuh-Uh Girl will show up. MemphisWeather.net has blogged that we have another possibility of winter weather Tuesday night. Models indicate this one will happen after rush hour Tuesday evening. One model predicts 3″ of snow, the other (which MemphisWeather.net tends to believe more) predicts less than 1″. I hope the 3″ prediction is the accurate one, so we can get a SNOW DAY on Wednesday! Bar None has started a Monday trivia night. Specials are $2.50 pints and $5 half-yards of beer. Starts at 7:30. I’m now hearing that the Silly Goose poker night is starting at 10. Heard that from one of the bartenders on Facebook, haven’t confirmed with Poker Jon. Hmmm. 10:00. That gives me four hours at Pint Nite. Just about right. Some excellent news for those who want to keep fit. The Harahan bridge, a railroad bridge built in 1917 that crosses the Mississippi River, had platforms on the side for auto traffic that were used until the Memphis-Arkansas bridge was opened in 1949. Plans are coming together to turn the north side track into greenline space for walking and biking to Arkansas. Top shelf idea! A friend of mine who bikes says there’s a beach on the Arkansas side of that bridge. Maybe it will get more use in the summer, and it’s good for Downtowners who want greenline exercise but don’t want to drive out east to the Memphis Greenline. More details in this CA article. Another CA article this morning profiles Mark’s Menus, one of my favorite sites and iPhone apps. This site lets you browse restaurant menus, and ask questions like, “Who near my current location sells an Italian hoagie?” If you like to eat out and have a smartphone, this app (which is free by the way) is a must-download. Tonight is the second What Women Want party at Christine by Shelton Clothiers. Stop by and help Christine pick out what to order at market this week. 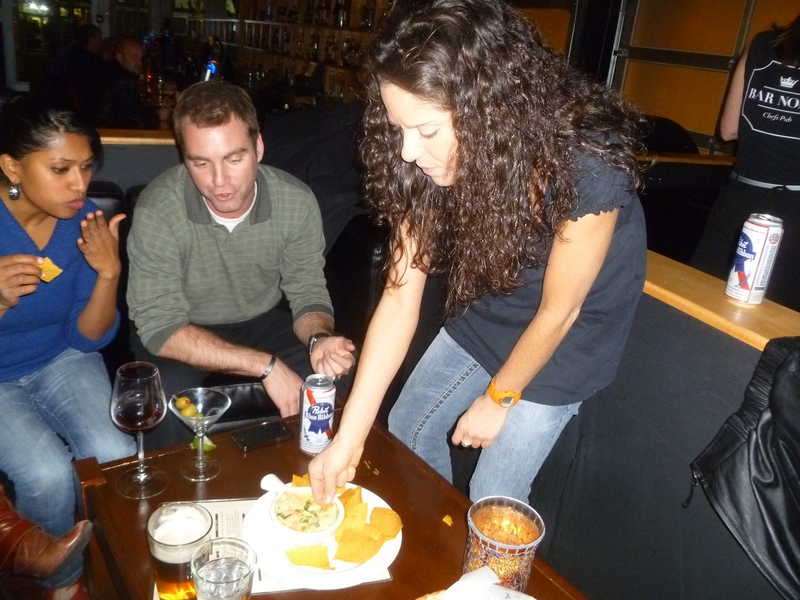 Drinks, food and fun. Free food? Wonder if the Nuh-Uh Girl will show up. The Silly Goose will have their second anniversary party Wednesday night, with Jeremy Stanfill playing. Voting has been going on this month among Majestic Grille customers to pick their favorite martini. Results have been announced, and the winner is the strawberry basil martini. (Cool, that’s the one I voted for!) The martini, normally $9, will be $5 all week. Today is Beer Can Appreciation Day, the 76th anniversary of the day beer was first served in a can. Celebrate by drinking a can of beer. I recommend PBR! Bar None, Flying Fish and Silly Goose have PBR cans, and I believe BB King’s and Black Diamond do as well. Bardog has Coors cans, and the Saucer has Foster’s Oil Cans and Tecate cans. If you read the novel Pepper Jack, set in Memphis and the Midtown Blue Monkey in particular, you’ll be interested to know that author Jon Pendergrass has started his own blog. Bookmark or subscribe to it to read Jon’s throughts, and to keep informed of future literary works. I missed brunch at the Majestic yesterday, but joined my friends at the Saucer to watch the Bears-Packers game. There were about five of us sitting at the bar watching the game, and one more person who hovered behind us the entire time. Can we not Superglue him to a chair? So, it’s the Packers and Steelers in the Super Bowl two weeks from now… my take on the game is something along the lines of “couldn’t care less.” I’m rooting for good food at the annual Super Bowl party I’m attending, and for good luck picking squares in the Super Bowl pool. I’d root for PBR but there’s a 100% chance of that happening, since I’m bringing PBR. Reminds me, I saw a flyer for the Flying Saucer’s “big game” party (they can’t call it the Super Bowl when advertising) they mention most drafts will be $3 pints all day Sunday and Monday. Bonus Pint Nite? Time to grab a sandwich and get back to work. Boring web updates this morning, fun PHP object-oriented programming project this afternoon. I’ll be at Pint Nite at the Saucer about 6. I’m a maybe for poker night at the Silly Goose at 9. More news already coming in, so there may be a second post after work. A couple of months ago, I was working on a project at work when a window popped up on my computer at work. “Scanning for spyware,” it said, and it looked like it was finding a lot of bad stuff. When it finished, it listed several courses of action I could take, of which the recommended one was paying $39.95 for “XP Antispyware 2010” which would remove everything it found. It looked very official, with a shield logo very similar to the four-color Windows logo. It would have been very reasonable to assume it was part of the Windows system software, trying to protect me. I knew better. I knew this was a “scareware” program, a program which did a fake virus/spyware scan in an attempt to get $39.95 out of me. I went and got one of our IT guys and had him take it off. However, a LOT of people would have fallen for it. Yesterday I found the Wikipedia page for this scareware program, which also goes by the names MS Antivirus, XP Antivirus, Win Antivirus, and about 30 other names that get as close to Micosoft’s trademarks as possible without infringing. The authors of this software, believed to be in Kiev, Ukraine, use affiliate marketing to find people to distribute their software via infected sites – meaning, the people who build the infected sites share in the $39.95 payday when someone purchases the “full version” of this junk. It was reported that the top affiliate made $158,000 in one week. If something with a similar name pops up and says your computer is infected, paying $39.95 is not the best option or even a good option, as it will just install more malware on your computer. If it happens at work, get your IT people and they’ll know how to take it off. If it happens at home and you’re good with computers, Google the name of the program (you may have to do this on another computer, as the programs sometimes block Google searches on their own name) for instructions how to take it off. Each variant is a little different so I can’t give exact steps that will apply to all of them here. In general, you need to find the name of the program in Task Manager, kill it, run a anti-malware tool, and then clean up anything it left in the Registry. If that sounds too complicated, pay a computer repair person to do it, but absolutely do not pay $39.95 for the full version. If you have friends or relatives who are not computer-savvy, you may want to show them the Wikipedia page about this scamware, so they’ll know what it is if they get hit with it. Unfortunately it’s found all kinds of different ways to distribute itself – since they’re getting paid, the affiliate marketing distributors seem to be quite clever about it. Currently goo.gl shortened links on Twitter are a popular way to redirect you to a site that downloads this junk to your computer. Hmmm… a few months before my computer got infected, I ran into a guy I knew from my U of M days while eating lunch. “I’ve known for years that you’re very good with computers,” he told me. “You should come over to the dark side, where the big money is.” Obviously, I didn’t pursue it, but I wonder if he was talking about building sites to distribute XP Antispyware 2010 and its brethren. Anyway, pass the word on about this scam software, and help keep everyone safe.